Gastroenterology: hepatitis of various aetiology, hepatopathies, hepatosis, hepatic cirrhosis, stomach and duodenum ulcers, erosive astroduodenitis, ulcerative colitis. Erbisol - medicinal preparation possessing immunomodulating, anti-inflammatory, an antioxidant, a membrane stabilizing and adaptogenic action, moreover, the drug improves the ability of cells and tissue regeneration, and facilitates the normalization of glucose and lipid metabolism. The structure is a complex Erbisol low molecular weight peptides having a pronounced biological activity. These substances have an impact on the immune system, thus facilitating and improving the functional activity and condition of organs and systems. The preparation stimulates the activity of killer T cells and NK-cells that destroy damaged, cancer and virus infected cells (including those of viral hepatitis), and also activates the regeneration processes, promoting tissue repair and organ, respectively, to improve its function. Erbisol normalizes balance of cellular and humoral immunity in patients with cancer, autoimmune and allergic reactions. Erbisol stimulates the synthesis of interferon, interleukin 2 and 12, and tumor necrosis factor and suppresses the production of interleukin 4 and 10. By this action of the drug, patients have accelerated healing of erosive and ulcerative lesions of the mucous membranes, wounds of various etiologies, hepatic tissue regeneration after diseases and improve the health of organs and tissues under hypoxic conditions (including chronic obstructive airways disease and asthma ). In addition, bronchial asthma Erbisol application leads to a reduction in seizure frequency and to reduce the dose of inhaled medication. It should be noted that the beginning of the anti-inflammatory action may be accompanied by worsening of Erbisol within 3-4 days. Thanks hepatoprotective effect and improve the functional activity of hepatocytes drug has a detoxification effect. Specific immunomodulatory effects Erbisol promotes positive therapeutic results in patients with diabetes, neuropathy, arterial disease and cancer. 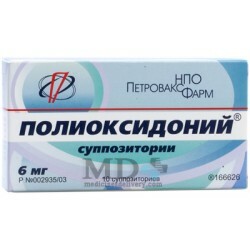 Occupies a special place in gerontology Erbisol preparation, their use leads to an improvement of the state (due to the regenerative action Erbisol), which in turn leads to improved functional activity of organs and systems. After initiation of therapy immunomodulatory effects Erbisol develops within 5-7 days, restorative - 2-3 days, hepatoprotective - after 2-3 injections. The studies found no teratogenic, mutagenic and embryotoxic action Erbisol. Diseases of the digestive tract and liver: hepatitis of various genesis, steatosis, cirrhosis, erosive and ulcerative lesions of the stomach and duodenum, as well as ulcerative colitis and erosive gastro. Diseases of the respiratory system and blood vessels: pneumonia, pulmonary tuberculosis, chronic bronchitis, angiopathy, vascular microcirculation disturbances etiology. In gynecological practice, the drug used in uterine leiomyoma, ovarian cysts, and pronounced premenstrual syndrome. The drug is also used in the treatment of patients with chronic fatigue syndrome, metabolic dystrophy, intoxication of various etiology, diabetes mellitus, autoimmune thyroiditis, various forms of allergic and autoimmune diseases, as well as patients exposed to radioactive substances. Erbisol can be assigned to speed the healing of post-operative and traumatic wounds, fractures, pressure sores, as well as for the treatment of periodontal disease and periodontal disease. 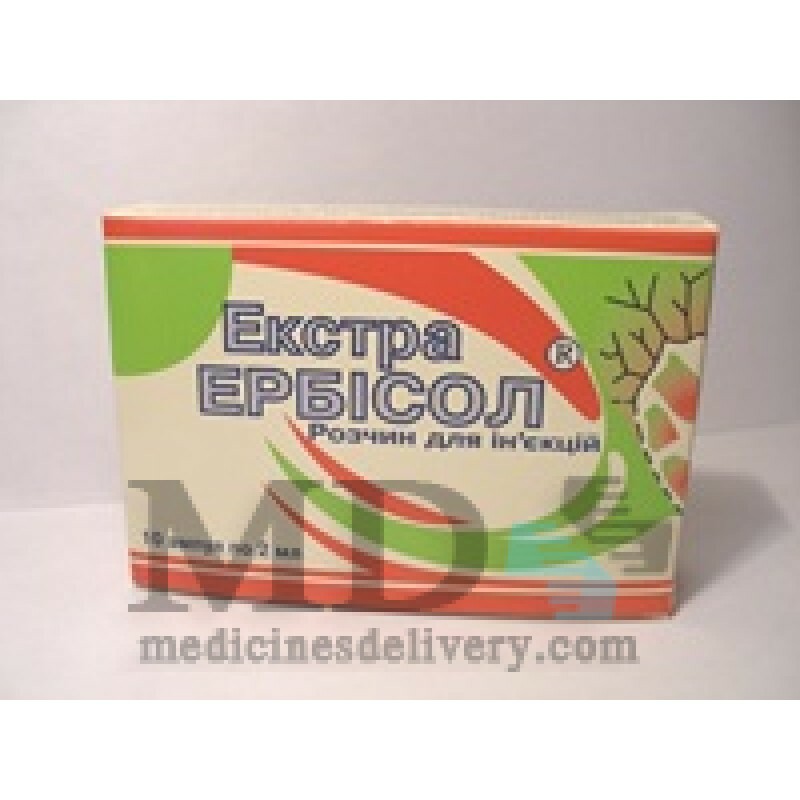 Erbisol as a tonic and drugs improve the function of organs and systems are used in gerontological practice. 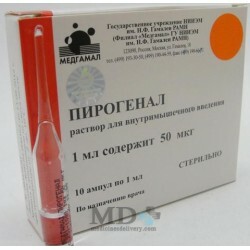 In oncology Erbisol used to increase efficiency and reduce the negative impact radioluchevoy and chemotherapy. 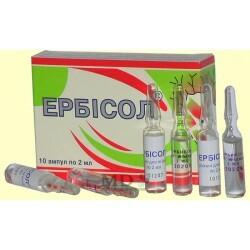 Note that in most cases Erbisol is complementary to the standard treatment of diseases and may be used as monotherapy. Erbisol for parenteral use. Allowed intravenous, intra-arterial and intramuscular administration of the drug. Erbisol introduced hronoritmy given organism. A single injection of the drug is recommended to appoint 20: 00-22: 00 if the daily dose divided into two administrations, the first recommended to appoint at 6: 00-8: 00, and the second at 20: 00-22: 00. The morning dose is administered 1-2 hours before the meal, and the evening after 2-3 hours after a meal. Adults usually recommend the introduction of 2-4ml Erbisol a day, a course of treatment lasts 20 days. 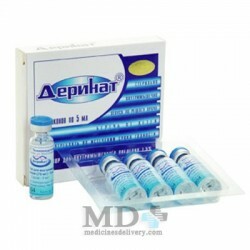 In various diseases of the liver, as well as acute inflammation, autoimmune and allergic diseases treatment is 20 days. Heading dose should not exceed 40ml Erbisol administered by the standard procedure. When the wounds of various etiologies, as well as periodontal disease and periodontitis in the first 10 days of injected 4ml Erbisol then transferred to the introduction of 2 ml / day. The duration of treatment of 20 days, is administered under the standard scheme. In bronchial asthma and other obstructive diseases of the respiratory system I degree of respiratory failure are encouraged to nominate the first 3 days of therapy introduction of 2 ml / day at a standard scheme. Then move to the introduction 2ml 2ml 17:00 and 20: 00-22: 00 for 5 days. Then return to the standard regimen of drug at a daily dose of 2 ml for 7 days. At the II degree of respiratory failure are encouraged to nominate the first 3 days of therapy introduction 2ml / day standard scheme. Then move on to the introduction of 2 ml at 17:00 and 2 ml of 20: 00-22: 00 for 10 days. Then return to the standard regimen of drug at a daily dose of 2 ml for 7 days. At III degree of respiratory failure and pulmonary tuberculosis are encouraged to nominate at 2ml Erbisol at 17:00 and 2 ml of 20: 00-22: 00 for 20 days. In oncology practice, patients who are shown holding radiotherapy recommended the appointment Erbisol standard scheme (daily dose 4 ml) for 1-2 days before the start of radiotherapy. Patients who have shown chemotherapy is recommended to appoint in 1-3 days before the start of chemotherapy 2ml / day in the evening for 12 or 25 days, starting from the second day of administration Erbisol added 2ml morning administration in the morning (total daily dose of Erbisol 4ml) in During the course of chemotherapy, and after 2-5 days after it. During the administration of chemotherapeutic drugs Erbisol morning dose can be increased to 4-16ml divided into several injections (between doses of chemotherapy and the introduction of an additional 2 ml at 17:00). If chemotherapy drugs affect the hormonal status, the introduction of Erbisol not earlier than 3 hours after chemotherapy drugs. The drug was well tolerated by patients, in a few cases noted exacerbation of chronic diseases, or intensification of the inflammatory process at the beginning of therapy Erbisol. This effect does not require withdrawal of the drug, and is a testament to the effectiveness of Erbisol. We can not exclude the possibility of developing hypersensitivity reactions. Pregnant women and breastfeeding, as well as children under the age of 14 years, the drug should only be used under the strict supervision of the attending physician. Patients with hypertension and acute forms of diseases should be used with caution Erbisol (may require dose adjustment). Erbisol may be appointed if the expected benefit to the mother outweigh the possible risks to the fetus. Erbisol the combined use enhances the effectiveness of antimicrobial agents and interferons. Do not use this drug was combined with ethanol and immunomodulators, the effect of which is associated with increased humoral immunity. Erbisol may increase the effects of hormonal drugs, biostimulant and bioingibitorov that is associated with the ability to enhance the sensitivity of receptors Erbisol. When using Erbisol at doses significantly higher than the recommended, patients noted the development of excessive excitability. Specific therapy with an overdose Erbisol not required. Solution for parenteral administration by 1 or 2 ml ampoules, vials 10 placed in a cardboard box. The product is fit for 5 years when stored indoors at a temperature of from 4 to 12 degrees Celsius. Solution for parenteral use Erbisol comprises: Low molecular weight organic compounds, non-hormonal nonprotein nature derived from embryonic tissue of animals, including oligosaccharides and glycopeptides, nucleotides and amino acids. Excipients. Before shipping Erbisol is covered with a aluminium film and soft packing film to prevent thermal and shocking issues.